My sense is there are a number of different ways to answer my question but I’m not sure how many. Please post your thoughts in the comments and as precise a location of the red cart as possible. I’ll update this in two days with the answer. And here’s a killer Desmos calculator that lets you adjust all kinds of parameters on the scrambler. Give your students two sites that offer two competing versions of the truth. Have them determine which one is true. Assign one student each day the role of official researcher. Henceforth, whenever a question arises, the researcher answers it, not the teacher. Students eventually start asking more researchable questions more often. Come into class with your own research question. Tell the class you need someone on the planet who knows more than you do about it. Have them find that person. I like the list. How adaptable are these items to a mathematics classroom? I observed how some students made progress in exercises without necessarily demonstrating understanding of the underlying concepts. The practice of “pattern matching” is something that Ben Eater and Sal had mentioned on several occasions, but seeing some of it happening firsthand made a deeper impression on me. It is encouraging that Khan Academy is aware of the issue, but machine-scorers remain susceptible to false positives in ways that skilled teachers are not. If we ask richer questions that require more than a selected response, teachers get better data, leading to better diagnoses. That’s not to say we shouldn’t put machines to work for us. We should. One premise of my work with Dave Major is that the machines should ask rich questions but not assess them, instead sending the responses quickly and neatly over to the teacher who can sequence, select, and assess them. BTW. Also from Chang’s blog: a photo of Summit San Jose’s laptop lab, a lab which seems at least superficially similar to Rocketship’s Learning Lab. My understanding is that Summit’s laptop lab is staffed with credentialed teachers, not hourly-wage tutors as with Rocketship. Which is good, but I’m still uncomfortable with this kind of interaction between students and mathematics. We think the work you’re doing with Dave Majors is really exciting and inspiring. Open-ended questions and peer- or coach-graded assignments are incredibly powerful learning tools and my colleagues at KA don’t disagree. We definitely have plans to incorporate them in the future. My old school last year relied on a teaching model where the students had to try and teach themselves a lot of math by utilizing classroom resources. 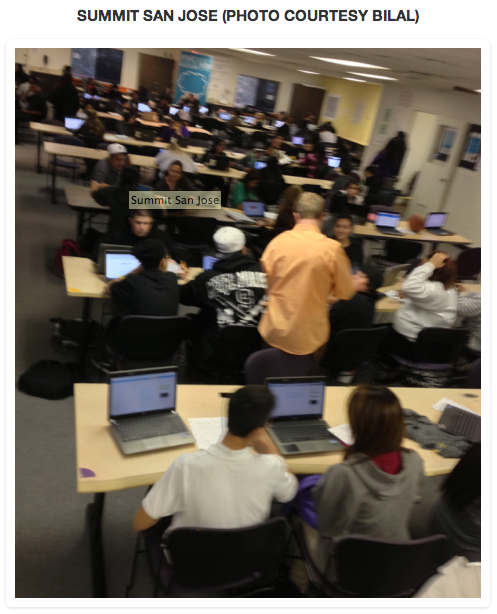 A lot of the practice was through Khan Academy or by students completing practice problems with accessible answer keys. Ultimately what happened was that the students only looked for patterns and had no conceptual understanding of the math at all. Even worse was that students who had “mastered” the concept were encouraged to teach the other students how to solve problems but they could only do so in the most superficial manner posssible. One way sites like Khan (and classroom teachers) can deal with this is by retesting — say, three months later, can a student solve the same problem they solved today? If not, they clearly only had a surface-level understanding or worse. I’d like to see Khan or other sites force students to retest on topics that were marked as “completed”. But then again, I feel pretty much the same way about miniquiz-style Standards Based Grading. Reminds me of the story about the tank-recognizing computer. I doubt we’ll have worthwhile computer scoring that isn’t susceptible to pattern-matching until we have genuine artificial intelligence. And then the computers will want days off, just as teachers do. KA does force review of concepts after mastery is achieved, generally a few weeks after completion. Problem is, doesn’t take students long to do the pattern matching again. We instituted a policy where students must make their own KA style videos explaining how to solve a set of problems that they struggled with. Best way we found to deal with the issue. Our math model as described as concisely as possible: students spend two hours per day on math; one hour in breakout rooms and one hour in the big room (seen in your picture) where students are working independently. In the breakout rooms, students work on challenging tasks and projects (many of which we can thank you for) that develop the standards of math practice, often in groups and with varying amounts of teacher structure. Development of cognitive skills via frequent exposure to these types of tasks is paramount to our program. It is also in the breakout rooms where students’ independent work – which is mostly procedural practice – is framed and put in context. Students’ know that their work in the big room supports what they do in the seminar rooms and vice versa. A supercut of moments in cinema and television where characters hate on math. In fairness, people hate math. Hollywood just turns on the cameras. BTW. Here’s the behind-the-scenes. I went to SubZin, searched for “math,” crossed off the (few) movies that had anything positive or neutral to say on the subject, queued up all the other movies in NetFlix and ripped those scenes over the course of a few months. Then I wrote down all the lines and started moving them around like an essay. The supercut was easier to edit knowing I had some large passages where kids talked about flunking math or adults referred to their own trouble with math. I was also able to make the movies talk to each other, like the dialog between Jamie Lee Curtis and Megan Fox. Mathematical genius appears in too many of those pro-math movies. Good Will Hunting, Numbers, Real Genius, Beautiful Mind — everyone watching those movies recognizes that the protagonists are far outside the norm. Worse yet, the math geniuses often aren’t even really doing math. They are math like Buck Rogers is science. Numb3rs is a particularly horrific example of this. Yup, we are the academic equivalent of dentists. I disagree with the title. I suggest: Hollywood Hates [School] Math. 2013 Apr 24. Nick Douglas of the Slacktory as a nice rundown of the supercut business. So our crazy new idea? We’ve put together four open ended, challenging probability games. Eight groups of 3 or 4 will spend tomorrow working on one of these games (2 groups for each game in each class). On Tuesday, groups will rotate and work on a different game, starting where the previous group left off. Since that was too easy, I next told them to create two more parallel lines that were neither vertical nor horizontal. They pretty quickly realized that it was all about slope. Their idea was to assign everyone a number and then have them go up and over by that amount (1,1) (2,2) (3,3). The real genius idea (only one class did it this way) was to translate that first line up using the rule (x , y) –> (x , y+1). I originally figured the “create two parallel lines” ActivePrompt to be a great team building activity and little more. Mr. Owen’s class completely surprised me. Must read. In the video, three administrators from Tecumseh Vista Academy K-12 School are interviewed and propose individual options for students to avoid serving detentions by paying the administrators according to their buy-out offers. There is nothing more exciting then seeing seeing if your Barbie is going to come crashing to the ground. The students learned so much and we ALL had a blast! Watch the clip. Get excited about how excited kids are to see the results of their calculations verified outside of the textbook’s answer key. My Algebra class worked on the detention buy out problem today, and they loved it. The discussions were great, and the students did not even realize they were using Algebra.